Double Dribble is a 5-on-5 basketball game for the NES, based on the 1986 arcade game of the same name. This is the first basketball game to come to VC, and unfortunately for us, it's not very good. 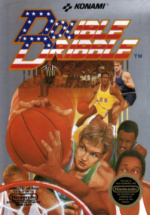 While Double Dribble was fairly popular back in the day due to the graphics (There are some cutscenes with fairly detailed stuff, like a crowd marching into a stadium or a player making a slam dunk) it hasn't aged very well. 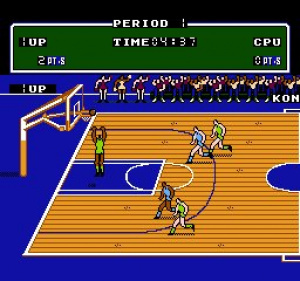 Like Nintendo's NES sports games, the game is pretty simple. All you do is dribble the ball and try to shoot it into the hoop on the other side of the field - There are no special gimmicks. Unfortunately, this is both a blessing and a curse, as while the game is fairly easy to play, it gets boring very quickly. To top it all off, there's no music during matches -- only during cutscenes and in the menus. All you'll hear during matches is dribbling and throwing sound effects. There isn’t much variation in the matches either, with only 3 teams (All of them American!). You can set the match time (5, 10, 20 or a whopping 30 minutes) and the number of rounds as well, and that's the only customization there is. If you have a friend willing to play the game (Good luck finding him/her!) you can also play against each other, which might serve as a fun trip down memory lane if you played the game back in the day, but even then you'll soon realize the game is just incredibly simplistic. So, despite being made by Konami, Double Dribble is essentially the same as Nintendo's own NES sports games. It looks quite a bit better than them, but it's just too simplistic to really warrant a purchase unless you were a fan of it back in the day. 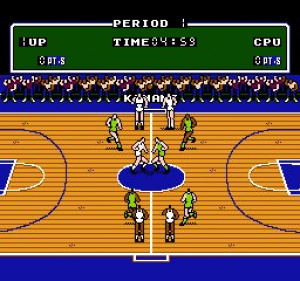 Konami also made the Blades of Steel for NES, which proves they can make good sports games - It's a pity Double Dribble turned out so lackluster. Maybe this is why there is no Nintendo-developed "Basketball" game? Hey, there are 4 teams to choose from! Also, I love this game! And my friends always want to play it! I guess to each their own, Riiibz. I'm almost tempted, but I guess I am having basketball fever at the moment with the playoffs.